Did you know that dimming a light switch to 75% of full brightness reduces the energy used by 20% and increases the life of your bulb by about 4 years? 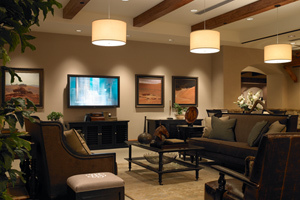 Did you know that the lighting in your home is the most often used electronic device and you have no control over it? Imagine not having control of the heat in your house. The temperature would either be 40 degrees or 80 degrees and not anything in-between! How would you like to have the safety and security of lighting up your home from the comfort of your car? You’ll never have to walk into a cold dark home anymore. It’s true, a lighting control system is the only home automation system that actually saves you money, saves you time, and saves you energy right from when you start using it. How long would it take you to go around your home and turn off all the lights before going to bed at night? Wouldn’t it be nice to press a “Goodnight” button that turns off the interior lights and also makes sure the exterior lights are on? It could even keep a dim light on in the hallway just in case the little ones wake up in the middle of the night. How many times have you laid in bed for the night and then ask your spouse, “Did you turn off the basement lights?” Well without a lighting control system; guess who’s going downstairs to turn them off! A simple glance at a keypad could tell you the lights are on and then pressing a button will turn them off right from your bedside. A lighting control system is all about convenience, saving you time from having to turn on all the lights to the right level, and then turning them all off at bedtime. Lighting control is about elegance, making the colors and fabrics in a room look their absolute best. Lighting control is about aesthetics, getting rid of that unsightly bank of light switches in the kitchen and replacing it with a single keypad that is color matched to any paint or décor. Who can remember what switch controls what lights? Custom backlit engraving on the keypads solves that. Lighting control is about safety, flashing the lights in the house to grab attention when emergency services are needed or pressing an “All On” button when you hear a disturbance in the night. Lighting control is about conserving energy, reducing your lighting costs in electricity and bulb replacement. Contact TechLife Media Systems to find out how a lighting control system can be installed in your new or existing home and start saving energy beautifully.